City of Segobriga, Saelices (Cuenca). 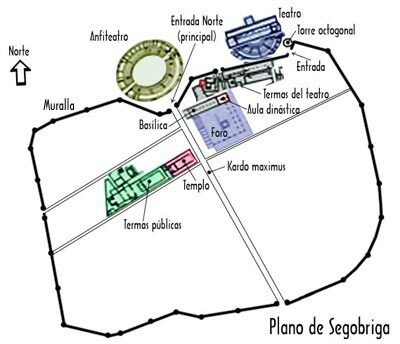 Hypothetic plan of Segobriga with the most outstanding remainings. The city of Segobriga was the cultural, adminstrative and miner center of a wide area at the Peninsular center. It was created, as usual, from a Celtiberian castra called Sego-briga -Plinius called it "caput celtiberiae"-. It was taken by Romans ca. 200 b.C. Placed on Hill of Greek Head at Saelices (Cuenca), it had a cosmopolitan population and lodged into its walls several public and religious buildings. It does not usually include private houses: they were built on next villages. There is only a private house at the top of the city: it seems to be a Senator's one. At Augustus age it became a Municip and was no more economically dependent of Rome. At 1st century elevation of buildings and walls began. This idea was designed because of an economic reason: exploitation of mines, specially those of lapis specularis, crystallized plaster used as crystal. Therefore a great number of slaves and free workers were sent to Segobriga. They found there a way for general improving. Indeed, native population made that citizens began business and even got their own gods. Native "financial benefits" came from mines and associated items: esparto, metalurgy, agriculture, or stone work. This state of things could not avoid a clearly hierarchical society: with very important social differences. As every Roman city, it enjoyed basic infrastructures: running water and gutters. For getting water many tanks were built, specially cisterns, that were communicated through aqueducts. Many canals for taking water to terma and fountains were made inside the city. The wall: it gave the city a poligonal form and was endowed with little watchtowers. There are two excavated entries: a northern door giving access to the kardo maximus or main street and an eastern door, with an octogonal tower at its side. This tower, the circus cavea summa and the wall were joined in a same construction. In fact, under this whole there was a vaulted corridor joining both doors. It was built with big limestones, sometimes cyclopean stones. Northern side is preserved in an acceptable state. Monumental termae: begun at the end of 1st century, they were built because of an Imperial order.BASIC INFORMATION. Theater's Termae: they were built close to the theater. There was a direct access from it through a door at the wall. 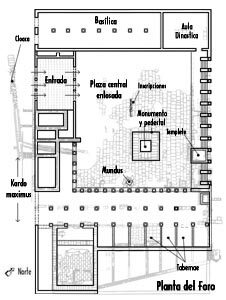 They had the usual rooms for these constructions: a gymnasium with a swimming-pool, dressing-room -apodyterium- with boxes, dry sauna -laconicum- with cold bath, hot sauna caldarium and toilettes -letrinae-. 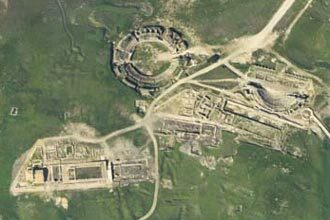 Comitium: It was close to the main entry to the kardo maximus, an axis for the city. Many buildings and a rectangular square -38 m. x 32 m.- with a stair for access and a central monument -only a part of its basis remains- have been preserved. At its northern side there were a basilica and another worship building, probably, a private one. At the other side there is a temple for Imperial worship. Basilica: Only cryptoportico can be seen -an underground area-. It is composed by two rooms, separated by a series of columns. Placed at the back side of the theater termae and close to the comitium, it could have served for ceremonies related to Imperial worship. Temple for Imperial worship: It was compòsed by an apse exaedra at its head and pavimented with mosaic. 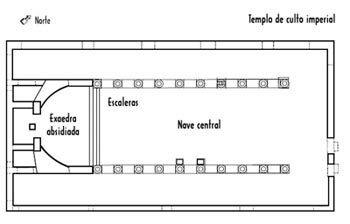 Access was made through stairs and a central nave separated by two lateral by two files of ten columns with big Corinthian capitals. Its plan was 36 m. x 20 m.
Importance od this city never fall at Visigothic age, as can be proved by remainings of an outstanding basilica and several necropolis. It was left after Arabic invasion and was later spoilt in order to elevate other buildings as Ucles Monastery.